It is impossible to imagine a world without the electrical devices on which we now depend. Mobile phones, computers, TV and other devices make our lives easier but at the same time make our health worse. Electronic devices emit harmful positive ions, creating an 'electric smog' that deteriorates the condition of the air in a room and negatively affects our health. 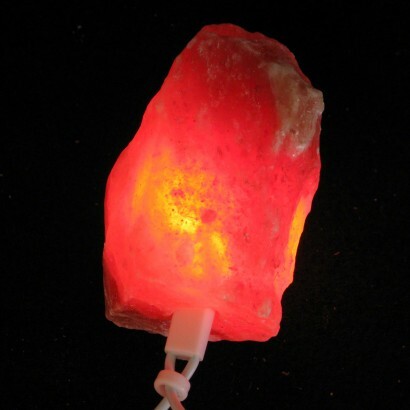 Himalayan Salt Stone is scientifically proven to be beneficial to our health, creating negative ions that create the same effect as air ionizers in a more beautiful manner. 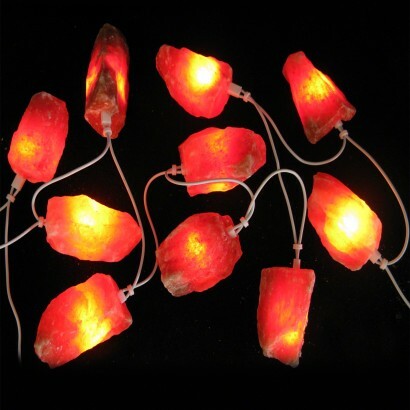 The Himalaya Salt Stone String Lights consist of ten segments of Himalayan crystal salt in it''s most natural form. The rich rose colour is flecked with different shades, glowing from within when the string lights are switched on. The soft glow and natural product perfectly recreates the ambient lighting of a spa, transforming the room beautifully whilst at the same time offering countless health benefits. Please note, the bulbs are designed to sit inside the salt stone shades loosely and for this reason, along with the natural weight of the stone, the Himalaya Salt Stone String Lights cannot be hung. This is a late review, i have had my crystals about 6 months. We have gas fire we don't use so put the crystals in the base. Removed the pebbles and it looks like a real hot coal fire. It looks warm and cosy. Best product i have bought. My partner who is Buddhist sits everyday in front of her Himalayan Salt Lamps for about an hour or two whilst she meditates, the soft orange glow helps her to relax. So much so, that she requested that I buy her two more sets to add to the previous ones bought only last week, thus giving her the ability to set up two relaxing places for meditation. After finding 'The Glow Company' through a search engine and reading all about them which sounded too good to be true, I placed my trust in them to deliver and I have most certainly not looked back since. First and foremost the thing that drew me to them was the ability to place an order without having to register although this was an option. Secondly, was the ease of being able to look at their vast stock and thirdly, I was impressed as to the speed and accuracy of the buying procedure. All the above is very important to making any prospective customer have faith in who they are dealing with, especially in these days of uncertainty and internet fraud. The Glow Company to all those people looking for first-class products from a first-class company, who keeps to their word and delivers on time.